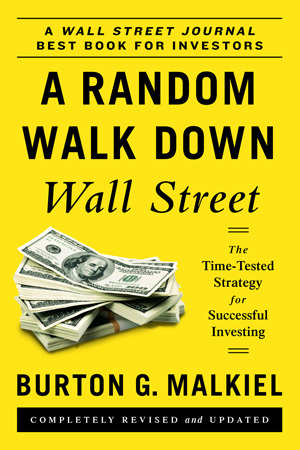 This month we are taking a look at A Random Walk Down Wall Street by Burton G. Malkiel, the 11th edition. One of the great things about this book is it gets updated (about every four to five years) with the most current and relevant information. The book was originally published in 1973. I know a book about investing doesn't sound as compelling as some thrillers or true crimes (my favs), but this book is a page turner and surprisingly hard to put down. It goes far beyond recommending how someone should invest and the basics of investing by going into the human behaviour and psychology of investing. Reading this book (as with Millionaire Teacher) I found myself saying over and over "I wish I knew that before" or "that is so obvious, how did I not recognize that?". Malkiel introduces two approaches for determining stock valuation: firm-foundation theory and the castle-in-the-air theory. The firm-foundation theory (investing) focuses on assigning value to a company to determine if the stock price makes sense. Although predicting the future of the stock market is impossible, understanding a company (it's sector, product, revenue, etc.) will give you a foundation to back your decision to invest in them or not. If you're a big fan of Apple and believe in the company and are tech-savvy so you understand it's products and direction, it would make sense as a possible investment. The castle-in-the-air theory (speculation) focuses on assigning a psychological value to a company. The most obvious example of this today I would say is with marijuana stocks. There have been for years now companies trading stock without revenue, a produced product, or (until very recently) a legal market. This theory involves very high risk with little or no solid foundation, just a good feeling or the dream of getting rich overnight. This theory has been very dangerous in the past and have lead to the formation of many bubbles. Bubbles are events where prices increase at a rate that is unsustainable and far beyond what the stocks could be properly valued at. Recent memory of a bubble could suggest Bitcoin ($19,501.03 USD back in December 2017 to closing at $6,620.40 USD on July 2 2018, a 66% decline) or the internet bubble of the 2000's. There have been documented bubbles from as early as 1593, referring to Holland's Tulip-Bulb bubble. The tulip craze hit its peak in 1637 when people were bartering furniture, jewels and even land to obtain tulip bulbs. Eventually the tulip market crashed and tulip bulbs became as valuable as onions. Bubbles forming aren't uncommon and in the 20th century and into the early 21st century were very common. They include: the electronics boom of the 1960's, the nifty fifty of the 1970's, the biotech bubble of the 1980's, the internet bubble of the late 1990's to early 2000's, the housing bubble of 2008, and keep in mind that these are all US stock market bubbles. I do believe that years from now cryptocurrency will be included and possibly 2018 - as we saw a lot of sectors lose a lot of value at the end of a long bull run. What is surprising in that during some of these bubbles companies were changing their name (adding: 'tronics', 'tech', etc.) to give the impression that they were involved in one on the hot new trends. This raised their stock price substantially for absolutely no reason. Today we have seen hundreds of cryptocurrencies created out of the blue. The major takeaway being don't be the 'greater fool'. If you buy an overpriced stock in theory you can only make money by selling it to someone (the greater fool) who is willing to pay more. Eventually the greater fool overpaid for a stock that no one will buy leaving the price to go nowhere but down, often significantly. By speculatively buying and trying to jump onto the big next thing, you're leaving yourself vulnerable to being the greater fool. The Biggest Game in Town refers to Wall Street and how the big time investment analysts do their job. There are two major techniques used to analyze stocks, Fundamental Analysis and Technical Analysis. Fundamentalist believe the market is 90% logic and 10% psychological, Technicians believe the market is 10% logic and 90% psychological. Fundamental Analysis uses such things as: growth rate, dividend payout, degree of risk and market interest rates to determine whether or not to buy a stock. Technical Analysis uses past stock charts to identify trends, again no one can consistently and accurately forecast the stock market so any trends identified are a bit of a guessing game. Fundamental Analysis is said to be a more respectable approach and is more widely used than Technical Analysis on Wall Street. Although neither approach is perfect, best results come from a combination of each. Malkiel discusses a number of complimentary systems and theories used with technical analysis and refers to that chapter as 'A Gaggle of Other Technical Theories to Help You Lose Money' and explores the efficiency and results of fundamental analysis funds and finds that investing in a broad market index fund is the best for long term investing results. No matter how sure someone is with their fundamentals or technicals, the market is random, unpredictable and therefor any 'sure bet' is nothing more than an illusion of riches. Risk is the biggest thing people get caught up in with investing, more often than not people are scared to lose their money (which is rational). Markiel talks about risk and introduces Modern Portfolio Theory (MPT) to the readers. MPT was invented by Harry Markowitz in the 1950's and what it is, is by grouping together a group of high risk stocks you could lower the overall risk of the portfolio, to an extent. It does sound counter intuitive, but by diversifying your portfolio your money is spread out across the market (or markets with global or international funds) so risk can be reduced if done properly. He also points out that according to research diversification can only reduce risk by so much and there becomes a point where it becomes steady with overall markets. You can't avoid risk completely, but it can be managed and reduced to a point. There are a number of different techniques to attempt to measure risk in the stock market. But, there isn't a perfect approach to analyze stocks to determine if it is a good idea to buy (fundamental or technical) and there isn't a perfect way to measure risk. No matter how you invest, you'll be exposed to some risk, there are ways to minimize that risk but nothing is perfect. Being up to date with the newest techniques can help aide you in your investment strategies, but if there was one perfect fool proof way, well there wouldn't be much of a point for me to write this article. Human behaviour plays a large role in investing and I think anyone can relate to it. Being overconfident, too prideful to sell a bad stock, or following the herd without doing due diligence (to name a few) dictate how we do with investing. It is very difficult to separate the emotion from investing and focus on the business side of it. Every company we invest in has the potential to be a losing stock, it is important to be able to identify that and have a plan (sell if the price goes below X% of what I bought it at). Part three is ended with a familiar argument, no investing approach is as tried and tested as investing in index funds. There's two quotes from part four that I think are very important for people who are managing their own investments: "You can only get poor quickly. To get rich, you will have to do it slowly, and you have to start now." - page 293, and "Every investor must decide the trade-off he or she is willing to make between eating well and sleeping well." - page 306. Managing your own investments can be extremely overwhelming and stressful, it is literally like having a second full time job. Even with that being the case there is no guarantee it will pay off and you can beat the market. Malkiel believes that index funds are the smart investment and if you'd like more information I'd encourage you to read this book. With most things, having a bunch of information isn't always the most helpful if we don't know how to apply it, so luckily there's part four. It contains practical information that you can apply in your life, the author is American so the information is USA account specific but the concepts are informative and there's similar accounts here in Canada. Malkiel talks about different investing accounts, strategies, how to invest for the long term and much more. Although the information in this book is great (and there's a ton of it) it is important to do your own research, look into your unique situation and find out what your best options are. Investing should be unique to each of us and no two people have the same financial situation or long term goals. This is an absolute read for anyone who is interested in investing, wondering how it all works or for someone who is interested in pursuing a career in financing. I'll even lend you my copy. Each of the four parts build on each other and the more you read the more in depth it gets. I think anyone can find positive takeaways from this book no matter what your experience or education in investing is. Part three is more technical and challenging to understand, but the rest of the chapters are smooth and fairly entertaining at times. Your money will never matter more to anyone else, than it does for you. Make sure you know how it's working hard for you. Have you read A Random Walk Down Wall Street? If so, let me now what you think of the book and of my review. If you have any comments or a review suggestion please let me know, I'd be happy to hear from you. For the next few articles, I'm going to be focusing on a concept that I think is extremely important in today's invest world, Investing versus Speculation. In the two books reviews so far, Millionaire Teacher and A Random Walk Down Wall Street, there's been a lot of emphasis on investing smartly and for the long term. As discussed in ARWDWS, bubbles have formed throughout history and it's easy to get caught up in them. Most recently I believe we've seen the crypto currency and marijuana markets go through such bubbles. When I started investing I don't believe I was educated to the level I should have been prior to getting started and have been susceptible to bubbles in some markets. I plan to share my experiences, tips I've learned and hopefully get some input from others I know and help educate readers so mistakes are avoided in the future.